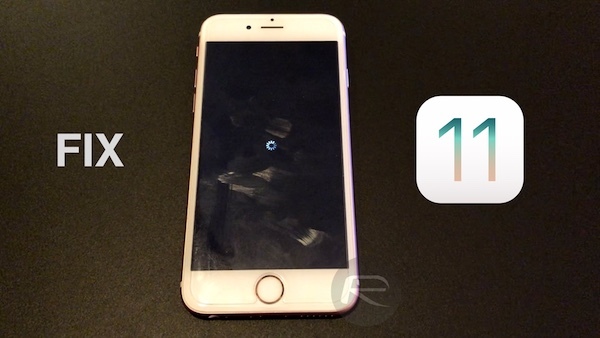 Is your iPhone on iOS 11 running into a random restarting, crashing, reboot loop issue on or after December 2? Well you are not alone. It appears that as soon as the clock turns December 2, some iPhone users running iOS 11 are experiencing random crashing of Springboard after every two minutes or so. The bug seems to be caused by App Store’s local notification API for third-party apps, meaning if you have a third-party app installed which is set to repeatedly send a local notification, such as an app which sends you notification to drink water, take meals or take weight during different times of the day, you’re likely to get affected by this bug. Interestingly enough, those running the latest iOS 11.2 beta 6 are not affected by this bug. It’s also important to note here that not every device appears to be affected, and those affected are running iOS 11.0-11.1.2 with a third-party app, which as explained earlier, is set to repeatedly send local notification in order to remind for something. Apple hasn’t issued any official statement on the matter as yet, nor have they said anything about fixing the issue, but they are likely to do that soon. In the meantime, you can follow the fix that has worked for me below. I have multiple iPhones and only one of them (iPhone 6s) seems to be affected by this bug. While doing something as simple as changing date back to December 1 or as time consuming as setting the phone from scratch using factory reset option might fix the problem, they have their fair share of issues and I won’t recommend doing them. Changing date to a day before December 2 for instance will likely mess up your Calendar, Messages and a ton of other apps that relies on it, and backing up, restoring iOS, and then restoring data is just too time consuming for many. What I’ll recommend doing instead to fix the problem for now is to head to Settings > Notifications and then try and look for apps that could be sending you local notifications for reminding something repeatedly throughout the day, or on a specific day. Remember, first-party Apple apps, such as Reminders, aren’t affected by this so don’t mess with notifications for them. Just identify any third-party app that might be sending you local notifications and simply turn off notifications for those apps until Apple issues proper fix for this bug. In my case, iHealth app turned out to be the culprit which was sending me reminders to take weight during different times of the day. Your case and mileage will vary. I have found this to be the best workaround for now without much compromises until Apple issues official statement and proper fix for this. Have you been hit by this bug? Share your experience and workarounds with us in the comments section below. UPDATE x1: Apple has released iOS 11.2 to fix this problem. Update to iOS 11.2 as soon as possible. More details on iOS 11.2 release can be found over at: Download iOS 11.2 Final IPSW Links And OTA For Your iPhone Or iPad. UPDATE x2: You can learn more about the proper fix for this bug here. any one try this ? is it working ? Woke up to my phone respringing every minute. Ended up restoring it just now. Then noticed this post. Please read the update at the bottom of the post. Thank you. I woke up to the same problem and was frustrated looking for solutions online but all referred to earlier OS versions. I thought my battery was on its last legs too as battery was plummeting even when off so decided to try and do a back up in case it died and did not want to lose everything. When I jacked in there said there was an update available so I figured I hope this might fix it. I came to Redmondpie to see what this update fixed and while scrolling to the bottom I saw the December 2nd issue and was glad I was not alone. Hope the update fixes it. THANK YOU! Woke up to the same issue, hard reboots had no effect, phone was very warm, and battery was plummeting. Disabled notifications for Fitbit app seems to have resolved it. Pretty awful QA on a public OS release, Apple! Yes I got it today, my phone was randomly restart and I try to hard reboots had no effect, so I choose to reset all settings and the problem solve. For those that purchased Killer Instinct on steam for your PC, this game too suffers from the 2nd December bug, boot the game, halfway through the MS logo, game crashes. Turn back the date, game works, I have no idea if a fix has been provided or not, thought I’d share, enjoy the rest of your day.